ROBERT TAYLOR'S TRIBUTE TO THE US NAVY’S AIR ACES OF THE VIETNAM WAR On 19 January 1972 Lt. Randy Cunningham and his Radar Intercept Officer, Lt. Willie ‘Irish’ Driscoll flying a Phantom F-4J destroyed a MiG-21 over North Vietnam. It was the first of five air victories that paved the way for them to become the US Navy’s only Aces of the Vietnam War. Flying as part of VF-96 off the carrier USS Constellation, Cunningham and Driscoll spotted two MiG-21s whilst escorting a reconnaissance mission. As the first MiG broke hard to avoid Cunningham’s heat-seeking Sidewinder, the Navy pilot then turned his full attention on the second MiG and fired again. This time it was a direct hit. 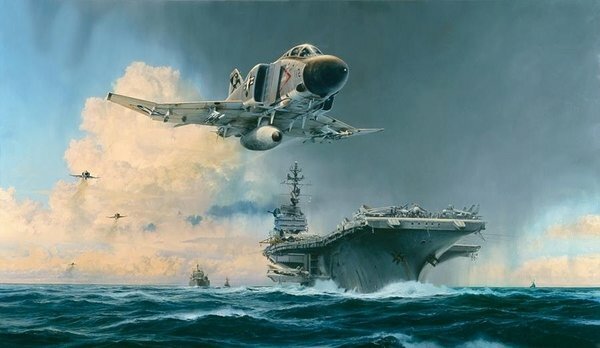 Robert Taylor’s incredibly evocative painting depicts Cunningham’s returning F-4 Phantom – call sign ‘Showtime 112’ – hurtling past the carrier at 500 knots just feet above the murky waters of the Gulf of Tonkin.